The Underground Railroad was not, in fact, a railroad. The Underground Railroad refers to a network of secret routes and hiding places for runaway slaves to escape to freedom in the 19th century. Abolitionists and other people sympathetic to the plight of slaves would help guide people in the middle of the night to free states and Canada. During its height in 1850, one estimate suggests that, 100,000 slaves had escaped through the Underground Railroad. The name Underground Railroad came about due to the use of rail terminology as a code so people could discuss the railroad in secret. Here is a list of common terms people would use in reference to the Underground Railroad. Many people associated with the Underground Railroad only knew their part of the operation and not the entire route. This was to protect the secrecy of the route and to reduce infiltration. Sometimes "conductors" would pose as a slave, enter a plantation, and then guide the runaways northward. Slaves would travel during the night, usually for 10-20 miles, and stop at stations or depots during the day and rest. Stations were often located in barns, under church floors, or in hiding places in caves and hollowed-out riverbanks. While the slaves rested at a station, a message would be sent to the next station to alert the stationmaster. 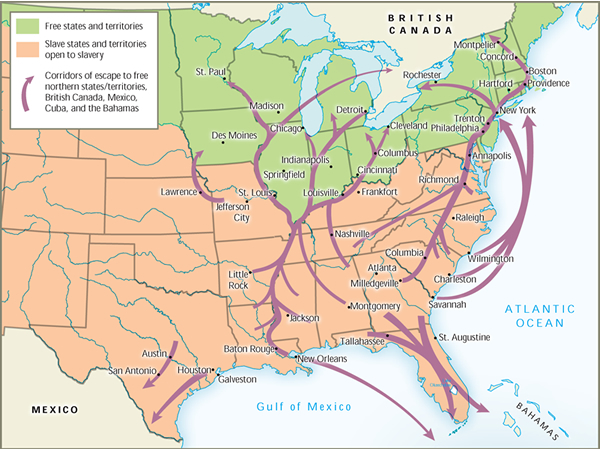 When most people think of the Underground Railroad, they think of a north-bound movement, but there were other routes part of the network that led south to Mexico or overseas as well. Routes were often indirect to confuse pursuers. Check out the map below to see the routes of the Underground Railroad. 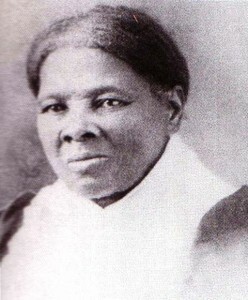 Harriet Tubman, an escaped slave herself, is one of the most famous and successful abolitionists from this time. After escaping slavery, she proceeded to make about nineteen missions to rescue over three hundred enslaved family and friends using the Underground Network. Not only did Harriet help guide slaves to freedom, she also helped change the general mentality of slaves. She helped hundreds of slaves realize their servitude and their power to change that, and this in turn terrified slave owners. Many consider her to be far more effective as the symbol that slave owners feared, than the few hundred she saved. Follow the Drinking Gourd is an American folk song first published in 1928. The Drinking Gourd is another name for the Big Dipper, which slaves used to figure out which way was north. According to legend, this song contained coded information that helped individuals navigate the railroad. Below are the lyrics.